I don’t know how you all feel, but I’m pretty sick of nursing pads monopolizing key space at the top of my blog. There’s really only one way to remedy that. While the past couple months have produced little (okay, no) blogging around here, I have been crafty in bits and spurts. While I daydream about my sewing machine, it sits idle upstairs in the guest room because I have yet to find a suitable and usable home for it. Instead, I’ve been knitting in spurts when I have time and the motivation. 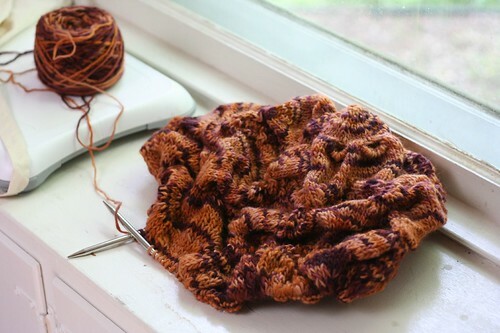 I hit a dead spot in my want to knit after I finished Clapotis (oops, I don't think the blog even knows about Clapotis!) and it seemed to last and last. For awhile, I didn’t even have a project on the needles. And sadly, I didn’t care. 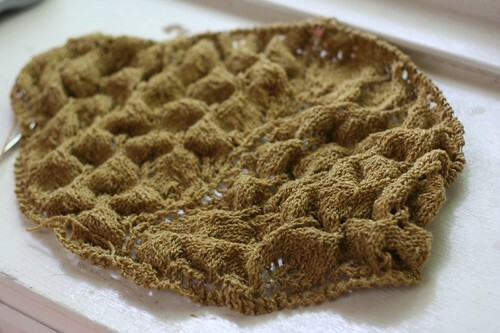 I was waiting for that must-knit project to reignite my knitting, but it never materialized. I started a project or two, but nothing grabbed me. The beginnings of a Hemlock Ring Blanket aka the destroyer of my knitting. PS - If you think your circular knitting needle is too short for a blanket, it is. Then we went to the Cape for a week. I brought a couple of projects, with an uneven ration of yarn to project, with the balls of yarn heavily outweighing the project. With me came my Shetland Triangle (or the ten or so rows I knit and a couple balls of yarn), my retro redux shrug (or three balls of Blue Sky Cotton), and my Anastasia Socks (a big cake of STR Rocktober). After sitting on our deck while Alice napped, I fumbled through my book waiting for it to engage me. When it didn’t, I picked up my Shetland Triangle. Within a couple of rows, I was getting back into the swing of things and felt oddly relaxed. The air felt fresh and clean and my shoulders light. Row after row appeared and I sank deeper in my chair. Gone were feelings of obligation to the project at hand and frustration that I forgot to mark my place in the pattern. I felt good and so did knitting. 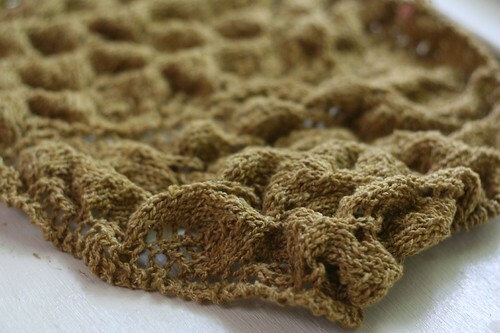 I’m still chugging along on my lace, but I’m okay with taking my time. For once, I feel more of a process knitter than product and it’s a nice change. 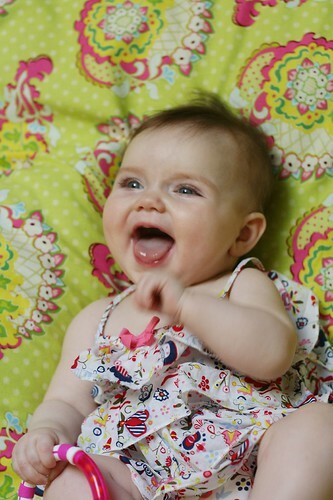 Also, look how big she got! And she's even bigger now. This pic is about a month old. they grow like weeds, don't they! I used your tut to sew nursing pads but sadly something went wrong with my lactation and pads are just reminder of what was supposed to be! Hope you are not gonna stuck into blogging gap again!